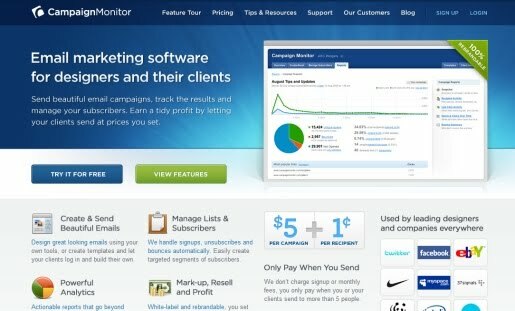 Campaign Monitor is a 100% Re-brandable email marketing software for web designers and their clients. This software offer everything a designer needs to run successful email marketing campaigns for themselves and their clients. With Campaign Monitor, web designer can Create and send beautiful email campaigns, track the result, and manage your lists and subscribers, create Great looking reports that let you measure the effectiveness of every campaign you send. Campaign Monitor is specially design for web designers to resell as their own product. create sub-accounts for your clients, rebrand the interface and set your own marked-up pricing. You'll make a tidy profit every time when your clients send e-mail.